Vito resides in Miami, FL. He maintains a global reputation of excellence as the world’s premiere futurist, innovation strategist and inspirational keynote speaker. His charming and entertaining style leaves nothing to be desired. Vito is the only keynote speaker who has given a TEDx Talk in five world continents. Vito is an esteemed former professor of Project Design and Management of Innovation at both the Polytechnic University and Bocconi University in Milan. 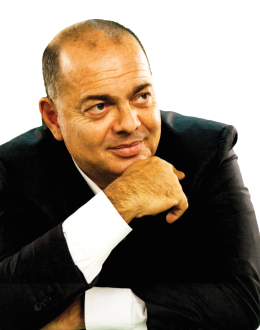 He has also served as Executive Director for the IMI Institute of UNESCO in Paris; the candidate city of Milan has chosen Vito Di Bari to be the Innovation Designer of the World Fair Expo 2015. In 2001, Vito Di Bari has secured his visions and legacy by founding Next Media Lab – a cutting edge international research laboratory, named „Milan’s think tank” by Wired Magazine, where he currently serves as CEO. After moving to Miami Beach, Di Bari has founded Di Bari & Associates – a design studio is changing the world a neighborhood at the time through his cutting edge artistic iconic urban installations, using recent discoveries in various fields such as AR, sensors and 3D printing. A recognized author on innovative theories, Di Bari has published a multitude of works including the books: Social Killer, Short Circuit, Web 2.0, The Future is Already Here (but we don’t know it yet), 2015, Weekend in the Future, Strategies for the Next Economy, The Digital Economy Encyclopedia, Key Words for the Net Economy, and Multimedia Management. In addition to his books, Di Bari is a contributing writer for various magazines including WIRED, Harvard Business Review, Panorama (Italy) and Il Sole 24 Ore (Italy). He has also appeared as a host for television’s Discovery Channel and the Italian broadcasting network Italia 1. Di Bari has held numerous titles of professorship, including: Professor of Design and Management of Innovation at the Faculty of System Engineering of the Polytechnic University and Professor of Innovation Design at the Bocconi University in Milan; Professor of New Media Theories and Techniques at the Communication Science and Technology Faculty of the IULM University in Milan; Professor of Multimedia Innovation Management at the Computer Science Faculty of the Polytechnic University in Milan; Professor of Design and Management of Multimedia Systems at the Design Faculty of the Polytechnic University in Milan; Scientific Director of the Master in Marketing, Communications and New Technologies at the Business School of Il Sole 24 Ore.
Executive Vice-President of SPN (Satellite Program Network) – America’s first satellite television network based in New York, member of the Scientific Committee of the International Institute for Opera and Poetry of UNESCO, Member of the Fiction Financing Committee Euro-Aim MEDIA with the Council of Europe (Bruxelles), Chairman of the Arts & Communication International Fellowship of Rotary International (Evanston, IL). In Italy, Chairman of the Scientific Committee of ASCAI (the Association of Corporate Communications Executives), member of the Advisory Board of the Accenture Foundation, the Scientific Committee of Harvard Business Review and the Executive Board of the Industrial Districts Association.